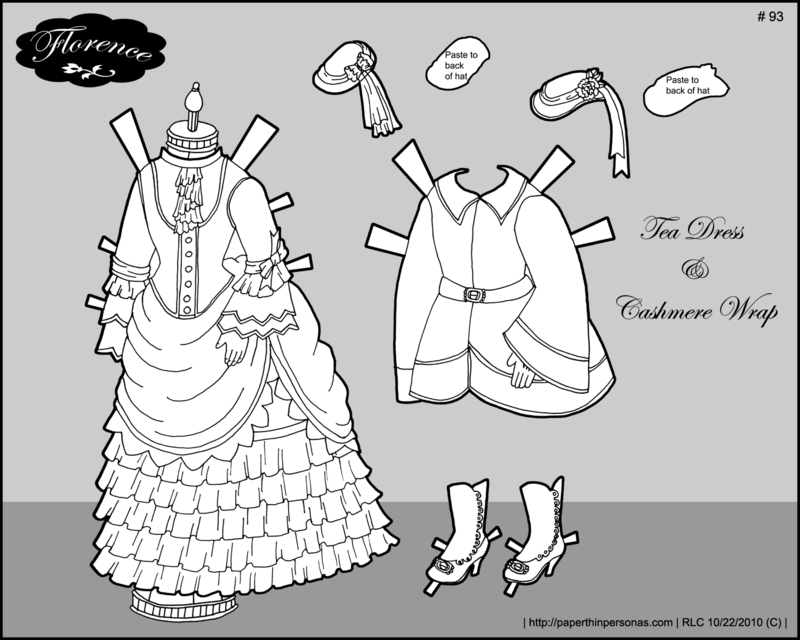 And so, today is the last Florence paper doll post. Actually, I can’t say its the LAST, because lord knows I might decide in five months that what I really want to do is draw the paper doll something new and then I will, but it is the last committed Florence post. So, since we are on the eve of the New Year (which is quite exciting) and I am considering the future of PTP, I have decided a few things. One is that the short run dolls are ending. I don’t know how I will post my paper-dolls that aren’t serial, but I think some sort of gallery might be the right format for them. I ended up having to reformat them in strange ways to get them to fit with the rest of the site and I didn’t always like the outcome. For the moment, Sundays will be paper doll free- however, I will be working on a Gallery for the site. We’ll see how long it takes me to produce it. 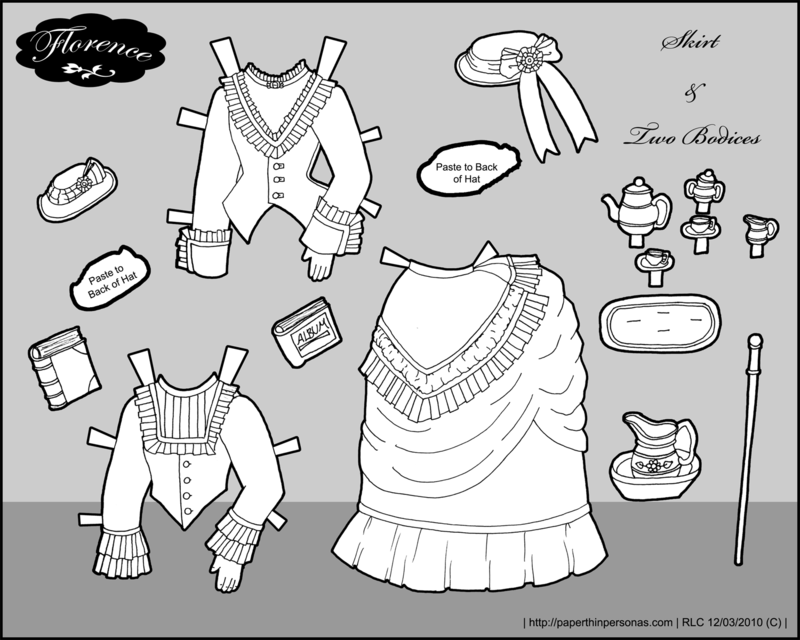 If you missed the first Florence post (which seems not surprising since this is the last Florence post), that is where you get the Florence paper doll. This is the second to last Florence post with her last being a wedding dress/dinner dress for next week. The regency wooden doll is going slowly. I have the doll drawn, but am struggling with regency underwear information. My sources suggest that while some women shed corsets (mostly radical french women), most still wore some sort of corset like garment. The challenge is figuring out what those garments were. So, I have six books on historical underwear spread across my dining room table while I try to figure it out. 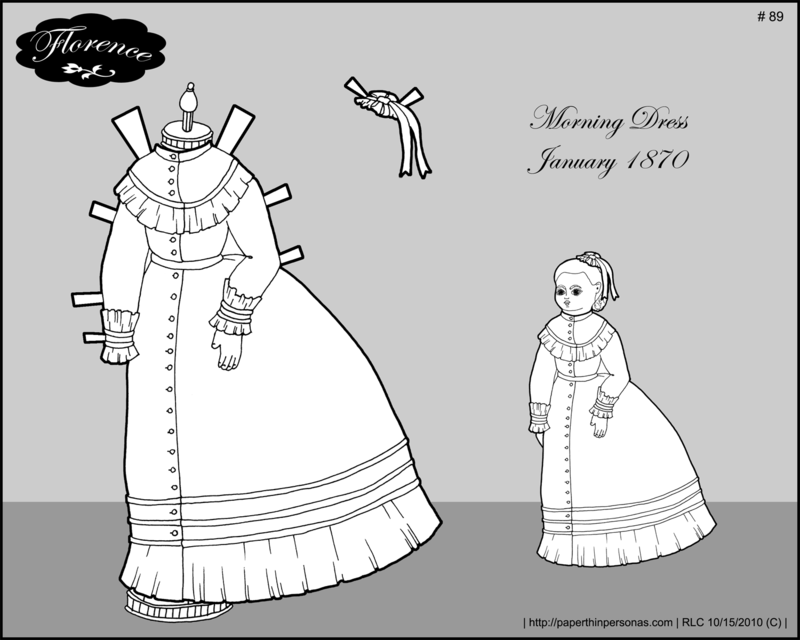 Speaking of paper doll research, I have been collecting a series of links I use for research. You can find them up in the new Research Resources section. Plus, if you need the base paper doll that wears these outfits, she’s here. It’s been a long week of writing a paper. It’s over through and turned in. I’m excited that its over. I’ve also been inking a fair bit today and working on something fun for Marisole for Monday which should be fun. I do like inking. It’s very calming after a long hectic day at work. Of course, working on the blog is a luxury which explains why I’m a little late today. I’ll be starting a new Fashion Doll Friday series on Dec 1st. 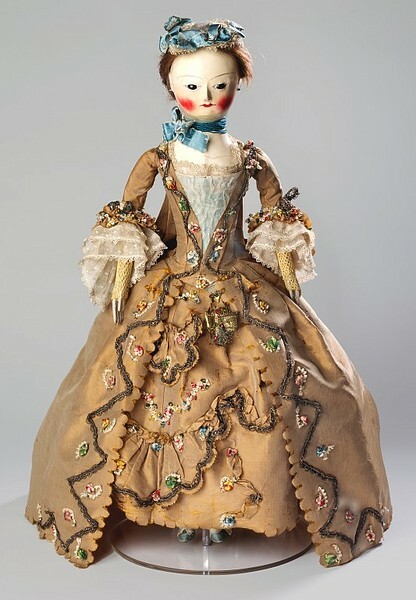 Currently, the regency wooden doll is in the lead, but it’s open until next Sunday. I must confess I rather suspected the regency doll would be in the lead, though the fifties fashion doll may yet recover and pull a head. Both sound like they would be fun. So, vote if you wish. Comment if you wish. Let me know what people think they would like. Florence, the paper doll that wears all these clothes, can be found here. Today, we have a morning dress for Florence. We also have a poll to vote for the future of Fashion Doll Fridays. My intention is to draw another historical fashion doll and then work on drawing a full wardrobe for her much as I have for the last year and a-half for Florence. A few people have expressed sadness at the ending of Florence. I hope people will come to like whatever comes after as much as they have liked Florence. She will continue for four more weeks (cause that’s how much I have draw for her.) And her final post is quite cool. So look forward to that one. 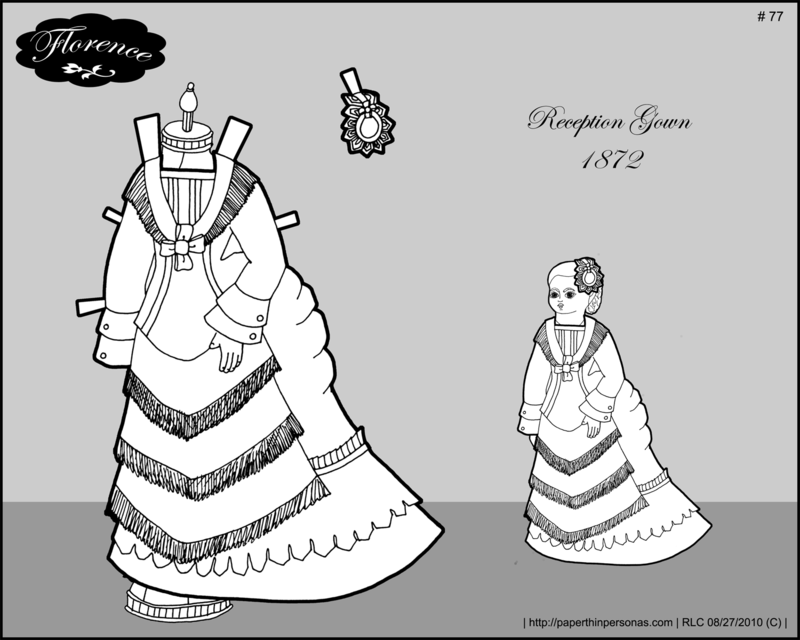 For me, the challenge of Florence was to draw a historically accurate French fashion doll based on the dolls produced by the Bru company (which I did, mostly… her head is more Gaultier or Jumeau in nature) and give her a wardrobe which she would have had from the period of the soft bustle. The question for the poll is, of course, what sort of doll should I draw next? The options are, in date order, a Georgian doll from the 1700’s, a Regency era wooden doll, a hoopskirt wearing china headed doll, a bisque headed doll from the 1910s (I couldn’t find a good photo of this except for in books, think Titanic era clothing) or a hard plastic 1950’s fashion doll. So, vote if you wish. Comment if you wish. Polls are open until Nov. 1 with the new doll series starting on December 1st. Looking for Florence? You can find the paper doll here. 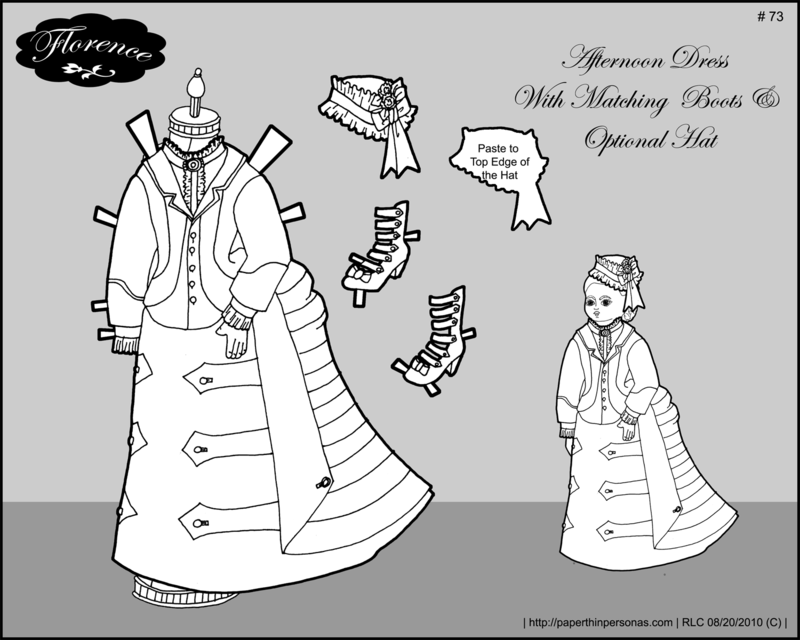 Today’s paper doll costume is based off an 1872 dress housed in the V&A Museum which has a fantastic costume collection. I first saw the dress in a book describing it as a yachting costume which is not, I found out later, how the V&A describes it. I’m still calling it a yachting costume. After I saw it on the paper doll, I realized it should have been a bit shorter. Oh well. I must confess I am getting a little weary of Florence. I have been drawing for her for over a year and a half. While I like the early 1870’s, I find my patience with the costumes is slipping. The stripes are much sloppier on this dress then they should have been and the bustle is awkwardly shaped. The paper doll has 22 dresses at the moment, not including hats and underwear. 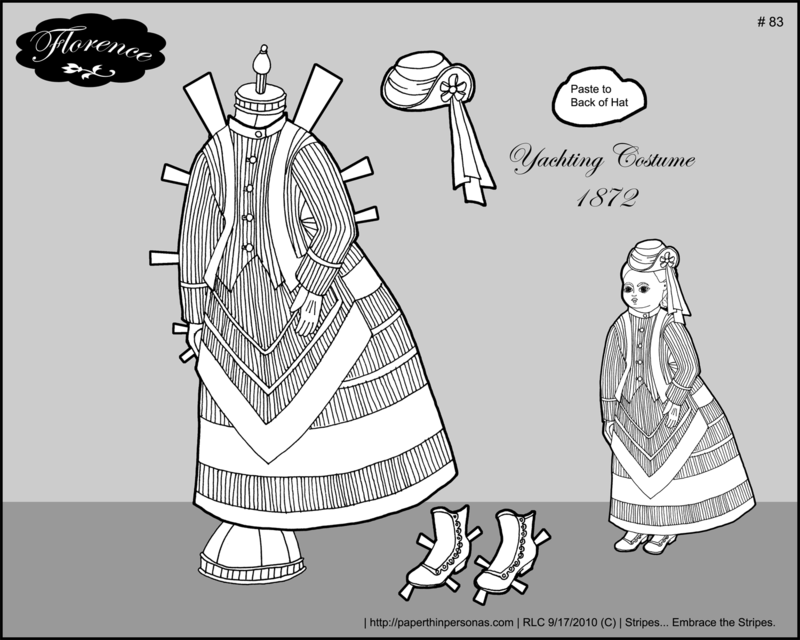 I have a list of paper doll dresses I still want to draw for her, but I worry I’m not really that interested in drawing them. Of course, I have nothing to replace Florence with, so I guess for the time being she’ll continue. 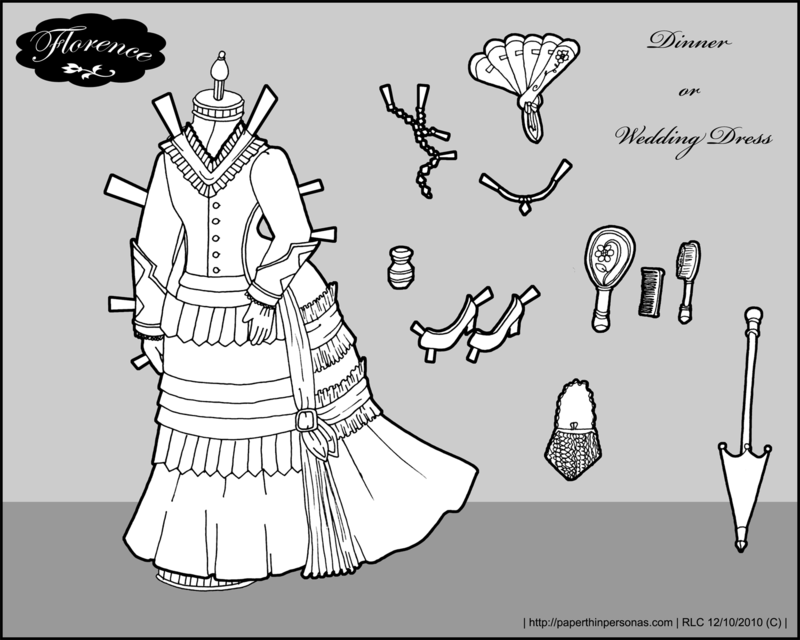 Still, I’m curious- If my readers could pick out an era to have a paper doll devoted too, which era would they choose? I might make a poll, but for now it’s just a casual inquiry. In case you missed the first post of this long running series, here is Florence, the paper doll whose wearing this dress yachting. So, there are a few scheduling changes happening which are explained over on the About Pages. Mostly, just me explaining how thing actually are working vs. how I thought things would work eight months ago when I started this mad crazy thing up after the site collapse. Oh, the adventures of a website owner. Somedays, I love my scanner/printer thing. It does what I ask it. It doesn’t complain. It fills my heart with joy and happiness and then there are they days when it refuses to scan, scans at an angle or simply does weird and mystical things as though it were possessed. Outside of striking it with incense and casting out the demons, I have no idea what to do about it and I don’t plan on using the incense solution. Today was one of those days, but eventually the stars aligned properly and I got a scan to turn into a printable paper doll. Despite by frustration with the scanner, or perhaps because of it, I’m just not pleased with this paper doll dress. I don’t like the fringe even though it is very very period and I don’t really like the folds of the bustle and I’m not pleased with the train and… Yeah, I could go on and on. I do think when I feel like I’m on a time press, I let myself get sloppier then I like. Still, they can’t all be winners, right? Need the paper doll for this gown? Here she is. Today was full of errands and craziness and being late with my Friday Florence paper doll post. These things happen. My classes start on Monday and I am looking forward to it. I do love class, but it’s also a little scary as I inch towards graduation. Afternoon dresses were worn when receiving guests in the afternoon. They weren’t worn out, so they didn’t need a hat, but since they could be worn as visiting dresses, I decided to include a hat as well. I loved the boots which are based on these wonderful shoes with lots of little straps that button up the leg. I’ve always really liked them. The dress is based on a real afternoon dress from the V&A Museum. Need the Florence base doll? Here she is.